I moved my bike from the balcony closet to the garage last night. I figured I would take a picture of it while it was in the livingroom. Before I took it to the garage, I went for a little spin around the neighborhood. I learned a couple things… first, the bike is not big enough to trip the parking gates. I had to wait for a car to come along and open them. 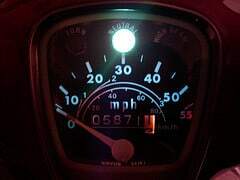 Second, the light for the speedometer is out. It probably just needs a bulb. When I came back to the parking lot, I met a fellow tenant who was getting off of his Yamaha YZF-R6. 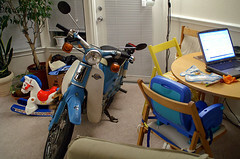 We chatted a bit about our bikes and he took a photo of my C70 with his camera phone. It turns out that he had never ridden a motorcycle before he bought his, just a few months ago. He said his friend had one, so he got one too. He didn’t take the MSF class, and failed his written test, so he has to go back tomorrow to retake it. Speaking of the MSF class, I am going to take it in a month or so. It should be really fun.